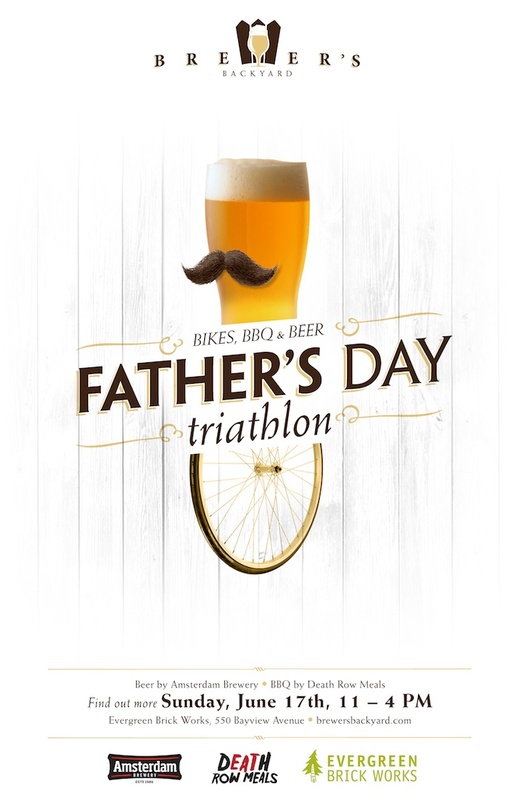 Please join us in kicking off Ontario Craft Beer Week at our 2nd Brewer’s Backyard event on June 17th, entitled the Father’s Day Triathlon! This event promises to be a big one, as we’ve got three great elements that comprise our Triathlon, namely Bikes, BBQ and Beer. First, the Bikes portion. The Brewer’s Backyard is the official after-party of Ride the Ravines, an inaugural charity ride through 25km of Toronto’s Bikeway Network organized by Evergreen and Cycle Toronto. So once the bike ride is done everyone is welcome to the Brewer’s Backyard for some well-deserved fun. And during the Brewer’s Backyard we’ll have some bike stunts and tricks at 2pm as well! Next, the BBQ. Our food for the Brewer’s Backyard is being organized by Death Row Meals, and it will feature delicious BBQ from local vendors Zane Caplansky of Caplansky’s, Jennifer Johnson of Fisherfolk, Rossy Earle of SupiCucu, Aman Patel of Indian Rice Factory. BBQ will range from $5-$10 per item. And finally, the Beer. For this Brewer’s Backyard we are thrilled to welcome the very bike-friendly Amsterdam Brewery of Toronto, and they’re going all out for the day. We’re going to have multiple beer stations serving different beers of theirs, including regular favourites Big Wheel, Oranje Weiss, Natural Blonde, Boneshaker IPA and 416 Urban Wheat. But that’s not all! It wouldn’t be a Brewer’s Backyard if we didn’t have some special one-offs, and the Father’s Day Triathlon will be no exception. You can expect to see 4 to 5 limited edition beers covering a wide range of interesting styles, including the debut of a Lipziger gose named Maverick and Gose. But you’re going to have to come to the event to find out what else is going to be available! Please note that the one-off beers will be extremely limited quantity, so come early to avoid disappointment. Beers will be available for $6 each. But that’s not all! We also have live music, with The Marni Levitt Collective at 1pm and Jerry Leger & The Situations at 3pm. You don’t need to be a father, or bring your father, to attend. But I’m sure the dads out there will have extra fun at the Brewer’s Backyard! We’re on from 11am – 4pm (note we are starting an hour earlier than last time) at the Koerner Gardens of Evergreen Brick Works, located at 550 Bayview Avenue. Admission is free and you can purchase food & beer at the event. Please follow us on Twitter for the latest news and updates. We hope to see you there!